The Volkswagen Connect assistance app allows access to a host of information, while the special edition model gets new features. The Volkswagen Vento also receives front side airbags for additional safety. Volkswagen India is the latest car maker to join the festive bandwagon with new Connect edition for the Vento, Polo and Ameo cars. The Volkswagen Connect is an intelligent connected vehicle assistance system that allows customers to connect to the car's system via an app, allowing access to more information about the car. 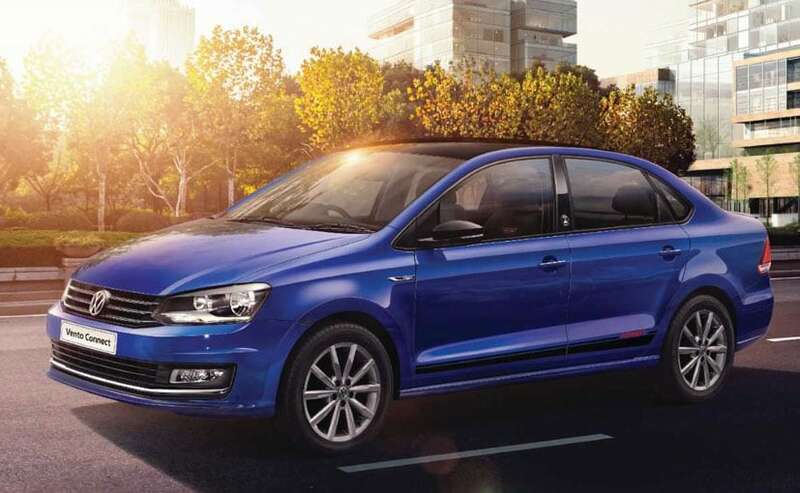 The Volkswagen Polo, Vento and Ameo Connect editions also come with a host of new features including the new Lapiz blue paint scheme. Volkswagen has also announced that the Connect Edition is being offered at no extra cost. The Volkswagen Connect assistance system enables users to connect the car with their smartphone through a Plug and Play data dongle. The dongle is fitted on the onboard diagnostics (OBD) port of the car and connects with the smartphone device via Bluetooth. Speaking on the launch of the Connect Edition, Volkswagen Passenger Cars - Director, Steffen Knapp said, "Volkswagen is transforming into a mobility provider with the aim to offer fully connected vehicle fleets. In India, with Volkswagen Connect and the recently launched 'Digital Workplace' experience, we aim to completely digitalize the customer experience right from pre to post-purchase experiences. With Volkswagen Connect, customers are empowered to manage a host of services such as driving behavior analysis, trip tracking, fuel cost monitoring, and other convenient features available on their fingertips. In addition to the new colour option, Volkswagen Polo, Vento and Ameo Connect Edition comes with a connect dongle, 16-inch gray Portago alloy wheels, leatherette seat covers, aluminium pedals, and carbon finished ORVMs. The Connect Edition also comes with a glossy roof and side foil, chrome badge "Connect" on the fender. The standard Volkswagen Polo, Ameo and Vento also come with moon stone coloured Radio surround trim, glovebox light, rear USB charging port and more. The Volkswagen Vento has also been updated with dual front side airbags, improving the safety levels further on the sedan, while the car gets new 15-inch diamond cut Allstar alloys on the Highline trim and a body coloured rear spoiler. Commenting on the new features, Knapp said, "At Volkswagen, customers have been at the centre of our business. Adding to the sportiness of our popular carlines, the new enhanced features along with dual front-side airbag on the Vento makes for an attractive value proposition for our discerning customers. With such unique offerings, it is our endeavour to offer world-class services to all our customers." The Volkswagen Polo range is priced between ₹ 5.55 - ₹ 9.39 lakh, while the Ameo line-up is priced between ₹ 5.65 and ₹ 9.99 lakh. Prices for the Volkswagen Vento start at ₹ 8.38 lakh, going up to ₹ 14.02 lakh (all prices, ex-showroom). All three models are available across Volkswagen's 121 dealerships pan India across 104 cities.